The supply of recruits plays an important role in plant and animal population dynamics, and may be governed by environmental and behavioral constraints on animals. Mated females of the mayfly genus Baetis alight on rocks protruding from streams, crawl under water and deposit a single egg mass under a rock. We surveyed oviposition and emergence of a bivoltine population of B. bicaudatus in multiple stream reaches in one high-altitude watershed in western Colorado over 3 years to establish qualitative patterns at a regional scale (entire watershed), and quantitative patterns over six generations at a local scale (one stream reach). We also measured characteristics of preferred oviposition substrates, performed experiments to test hypotheses about cues used by females to select oviposition sites, and measured mortality of egg masses in the field. Our goals were to determine whether: (1) hydrologic variation necessitated dispersal of females to find suitable oviposition sites; (2) the local supply of females could provide the supply of local recruits; and (3) local recruitment determined the local production of adults. The onset of oviposition corresponded with the decline of spring run-off, which differed dramatically among years and among sites within years. However, eggs appeared before any adults had emerged in 8 of 22 site-years, and adults emerged 2–3 weeks before any eggs were oviposited in 3 site-years. Furthermore, the size distribution of egg masses differed from that predicted by the size distribution of females that emerged from seven of nine stream reaches. Protruding rocks and eggs appeared earlier each summer in smaller tributaries than in larger mainstream reaches, suggesting that hydrologic and behavioral constraints on oviposition may force females to disperse away from their natal reach to oviposit, and possibly explain the predominantly upstream flight of Baetis females reported in other studies. Local oviposition rates in one third-order stream-reach increased rapidly as soon as substrates protruded from the water surface, and females preferred large rocks that became available early in the flight season. However, females oviposited on <10% of all available rocks, and <65% of preferred rocks as determined by an empirical model. 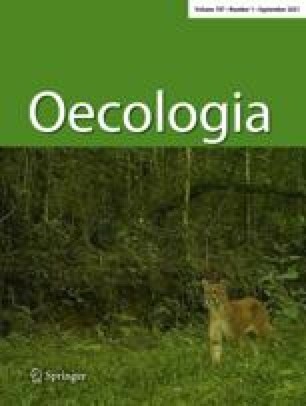 These data indicated that the timing of appearance of suitable oviposition sites determined the phenology of local recruitment, but that preferred oviposition sites were not saturated. Thus, the magnitude of local recruitment was not limited by the absolute abundance of preferred oviposition sites. Only 22% of egg masses observed in the field suffered mortality during their embryonic development, and per capita Baetis egg mass mortality was significantly lower on rocks with higher densities of egg masses. Thus, we suspect that specialized oviposition behavior may reduce the probability of egg mortality, potentially compensating for the costs of dispersal necessary to locate suitable oviposition sites. Finally, the number of adults that emerged at one stream reach was independent of the number of egg masses oviposited over six generations of Baetis; and local recruitment was not a function of the number of adults of the previous generation that emerged locally. The patterns of oviposition and emergence of Baetis found in this study are consistent with the following hypotheses. Recruitment of eggs in a stream reach is not limited by the local supply of adults, but is a function of the regional supply of dispersing adults, which are constrained by the spatial and temporal distribution of preferred oviposition habitat. Furthermore, subsequent local production of adults is not a function of the supply of recruits, arguing for post-recruitment control of local populations by processes operating in the larval stage (e.g., predation, competition, dispersal, disturbance). Processes affecting larval and adult stages of Baetis act independently and at different scales, thereby decoupling local population dynamics of successive generations.